The trip to Si Thep began at Bangkok’s Mo Chit Terminal, which services centres to the North and Northeast of the capital. A taxi there from Bangkok’s Khao San Road area cost 140 baht. We arrived at 11.25 a.m. and found that we were lucky as there was a bus to Phetchabun leaving at 11.40 a.m.. There were only a few buses per day on this route, so things were going out way. We bought two tickets to Si Thep, which is situated 120 kilometres south of the provincial capital, and they only billed us 250 baht each, which was a 75 baht discount from the full ticket price. The bus journey took us north through the Bangkok suburbs, which were characterized by an interminable sprawl of shopping malls, cineplexes, car-parks and apartment blocks, all seemingly poured out of a cement mixer. There were also an endless spaghetti-tangle of freeways and flyovers erected on concrete pillars, catering to the vast array of vehicles which were making their way around the Thai capital. After about half an hour we reached Rangsit, a nondescript satellite city on the edge of the capital. We had seen numerous English teacher jobs in this part of Bangkok. Cameron said he could think of little worse than working out here in the far-flung suburbs of Bangkok and said we could safely ignore any future job ad postings for Rangsit. From Rangsit our trip took us roughly north to the fringes of the historic city of Ayutthaya, a former national capital. We had spent a few days there as recently as 2006, so we had no intention of stopping there again. We stayed on the bus and continued north to the little-known town of Saraburi. By this point we were about 150 kms north of Bangkok. It turned out that Saraburi had been left off traveller itineraries for a reason: it was just another scruffy Thai market town with the usual collection of government buildings and tatty, concrete shops. We stopped at the Saraburi Bus Station in the centre of town, took on another couple of dozen passengers and then set off again. The last phase of our journey was by far the most interesting. Highway 21 took us from the lowlands of Saraburi up into the hills of Phetchabun, a fertile province little visited by travellers. Situated between the hotter, low-lying provinces of Central Thailand and the drier provinces of the Khorat Plateau- now most commonly known as Isan or Isaan- Phetchabun was a transitional province known for its high limestone peaks and the Pa Sak River, which ran along its length. As the road gained altitude, limestone landforms often appeared in the background, with fertile, green agricultural lands growing beneath them. 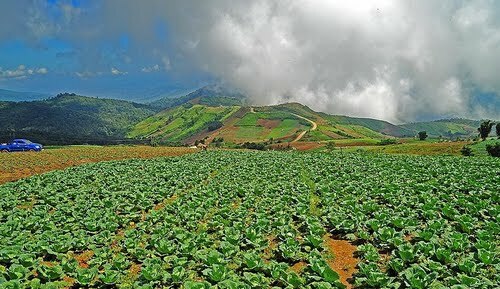 Interestingly, it was said that the name of the province, Phetchabun, meant crop-yielding land, and there were a variety of crops being grown. Whereas the Chao Phraya basin was dominated by intensive rice cultivation, in Phetchabun we saw sunflower fields, vegetable gardens, sugar-cane and trucks bearing huge loads of hay away as fodder. The layers of sediment laid down by the Pa Sak River had made this a very fertile part of the country. For the history buff, the Pa Sak River had another importance. As I have shown before, in antiquity the rivers of Thailand were its highways, and the Pa Sak River had linked this corner of Thailand with the populous lowlands below. In the Dvaravati era, most of the larger Mon settlements had been in the lowlands, making them the most obvious markets for any goods produced in this area. I kept an eye out for the river but it never appeared. It must have been several kilometres away, just out sight. Nonetheless, I knew we had now entered the Pa Sak River, which had been the lifeblood of the ancient Dvaravati city of Si Thep. After about an hour, we arrived in the modern market town of Si Thep and got down off the bus. Cameron had booked us a couple of nights in a “resort” just south of town. At fifteen dollars a night, we weren’t expecting luxury but we were happy to have a place to stay within striking distance of the ruins. Just ahead of us were a group of three-wheeled vehicles known as samlor. I went over to them and haggled a ride out to the resort with them for 100 baht. It was only a few kilometres away on the eastern side of the road. Boasting some exotic, Asian-style gateways, ponds and columns, it had made an attempt to look like an ancient city itself, and the rooms were also in the modern tropical style. Called the Picha Waree resort, it was a true bargain for the price- the discount probably reflecting the dearth of tourists in that part of the country.